Central Location. Harbour View. Perfect For City Vacation. (Please note: Minimum stay is 4 nights). Newly build apartment – with all modern facilities for a perfect city vacation for a couple or family. The apartment is my vacation apartment when I'm in Denmark, so you are not intruding my privacy by renting the apartment. The living room and kitchen area has floor to ceiling windows to get the best out of the fascinating view of the harbor and city. The furniture is wooden Asian, stylish, but robust and meant to be used. The living areas include an entertainment corner with large flat screen TV, TV box with access to Netflix etc., DVD player, Bose Sound system. The balcony is in the direction for afternoon sun and harbor view. Barbeque – gas heated – makes sure you will have a perfect setting for the dinner at home. Kitchen with atmosphere and all the tools you need to cater for a family when you don’t want to go out. Two large bedrooms make a comfortable sleeping of 5. The master bedroom with a king size bed, and the second bedroom with a bunk bed (queen size under, single up). The large bathroom with shower also includes washing machine and tumble dryer. Floor heating in all rooms provides a very comfortable room temperature – and makes the apartment terrific for all year holidays. Private parking space in locked basement with direct lift access to the apartment. I currently live in China with my family. This Copenhagen apartment is my vacation apartment when I'm in Denmark, so you are not intruding my privacy by renting the apartment. Plenty of dishes - so you don't need to wash up between every meal. Full kitchen with all you need to prepare a nice meal for the family. A male and a female bike can be used free of charger. We had a brilliant time here with our two young children. Allan was on hand to ask any questions and he made staying in Copenhagen a breeze with his use of travel cards. The flat was quiet, clean and quirky with its Asian feel. It had all the mod cons a family with young kids would need. Thank you for a lovely holiday. Brilliant location and property. Fantastic views and had everything we needed. We had an amazing time would definitely return! We enjoyed our stay in Allan’s apartment very much. The apartment is excellent and well equipped with a feel of a comfortable home. It was perfect weather to enjoy the balcony with views of the harbour. The location is very convenient - just a pleasant ferry ride away from central Copenhagen or an easy stroll. There are convenient shops and several restaurants nearby, and even a beach! Allan has thoughtfully provided travel cards, which made public transport very easy. We would be happy to return. The apartment is close to downtown and easy to access everything without being in the center of it. It's quiet and has a beautiful view. Allan has thought of just about everything you could need. Having parking was great. The bikes were fun. We were very grateful for this home base. We ate in several times and cooked at home which was nice to be able to do. Allan was incredibly accessible. Perfectly set up for guests. Great quiet location. Close to everything needed including groceries, public transport. Amazing views. Bikes were essential for the full experience of Copenhagen and were very much appreciated. Thankyou for a wonderful stay Allan. Allan's apartment was a great place to stay in Copenhagen. It's a bit removed from the center of things, but only about three blocks from the 250S bus line, which takes you right down to the Central Station in 20 minutes or so, and the harbor boat-bus is even closer. In nice weather, it's only a 25 or 30 minute walk to Central Station. The sixth floor apartment has an amazing view (the harbor side is entirely floor-to-ceiling windows), especially at sunset. It's also just a block from Irma, a very nice market with just about everything one could want, including decent selections of fruit, veggies, cheeses and wine, as well as ready-to-heat gourmet prepared foods. Scarpetta, an excellent Italian restaurant with a nice choice of small plates, is just a block-and-a-half down the street. Beds in the main bedroom are comfortable and there's far more closet space than you're likely to need. One of the things we liked most about the apartment was the quiet -- we never heard a sound from other apartments. Kitchen and dining area are great, and all the essentials and many extras are provided. Of course there's not enough ice for American tastes, but has anyone ever stayed in a European apartment where that wasn't true? Television, sound system, DVD player and quite a large selection of DVDs went unused by us, but looked excellent. And the WiFi was very good, indeed. The living area is an attractive space. The day-bed sort of piece of furniture that provides the main seating could be more comfortable, but that and the addition of a reading lamp are the only suggestions we have for improvement. Allan's "Welcome Guide" is the best and most organized we've ever seen! You simply can't go wrong with this place. 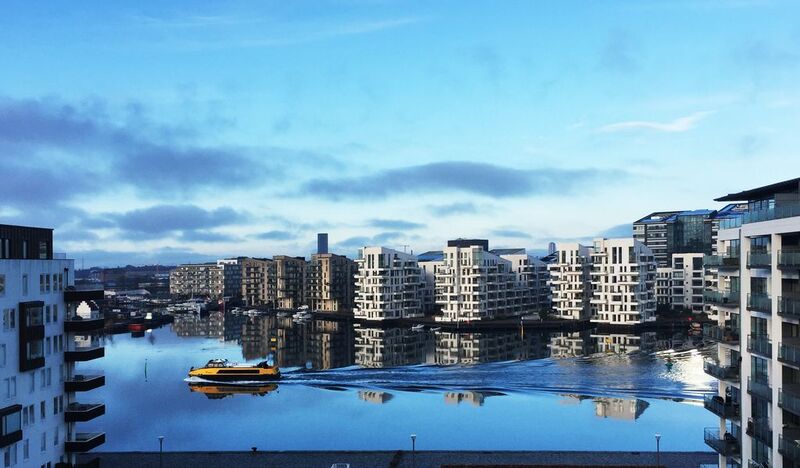 Located in the fashionable city area of Islands Brygge with cool cafes, restaurants, and good quality shops. Walking distance to city center, tivoli (amusement park), shopping mall, theaters, museums, galleries etc. In this apartment you are close to explore all aspects of what makes a city holiday inspiring whether it is the fashion, design, architecture, culinary or nightlife scene that attracts. The harbor bath is a 10 minutes walk from the apartment and on a summer day it gives access to a swim in the perfectly clean harbor, as well as joining the crowd who hang out for a swim, a picnic, a drink or maybe a dance at one of the many outdoor concerts. Public transportation is very easy and nearby. Buses 5 minutes away and the city-trains and metro station is within 10 - 15 minutes walking distance. There are even harbor buses operating nearby using the same ticket system as the Copenhagen public transport system with free transfer from other buses, Metro or trains. By bike: 10 minutes (there are 3 bikes at the apartment, and a bike rental store near by). Bus: 5 minutes walk from the apartment there is a bus stop for line 250S which goes to the Central Train Station / Tivoli. Departure every 10 – 20 minutes. City-train (called S train): 10- 15 minutes walking to the station, departs every 3-5 minutes, connects you to every where in the city. Metro: : 15 minutes walking to the station, departs every 5-10 minutes, connects you to every where in the city. Boat: : 5 minutes walking - leaves every 30 min, connects you to close to downtown.